A bright green apple, Greensleeves (Malus domestica 'Greensleeves') was introduduced into the UK from Australia where it first appeared in the 19th Century. 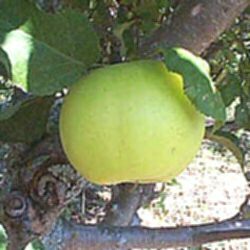 Greensleeves is a very juicy apple with crisp and tangy taste. A reliable mid season variety with pale greenish yellow skin. A little like some men off the Jeremy Kyle show in that it parts with its seed readily for others to bear its fruit i.e. considered a great variety to pollinate other apple trees. For those who like firm crisp apples then Greensleeves apple is a must. Self-fertile/Not self-fertile: This apple is self-fertile and does not require another apple tree nearby to produce fruit. It is so self-fertile, you could plant it in the land that time forgot where apple trees have not evolved yet and you would still get a crop of apples. The locals might look at you a bit funny though as you walk through their village/town/mud huts/camp munching on a strange green juicy thing.